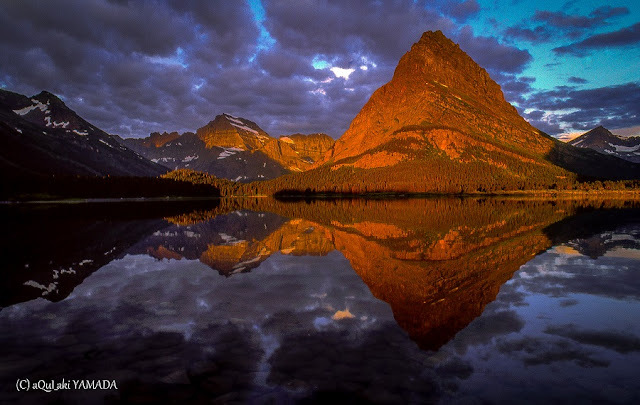 Mount Gould is a peak on the Continental Divide in Glacier National Park, Montana, United States. It is the highest point of the Garden Wall, a distinctive ridge of the Lewis Range. It is most notable for its huge, steep east face, which drops 4,000 ft (1,220 m) in only one-half mile (0.8 km). This face provides a backdrop to Grinnell Lake, and is often photographed. The first recorded ascent of Mount Gould was in 1920, by Frank B. Wynn, Harry R. Horn, Henry H. Goddard, and party. They used the West Face route, which is the easiest and most commonly used route today. It starts from the Highline Trail, which skirts the west side of the peak, and involves some rock scrambling but no technical climbing. Climbing the sheer East Face of Mount Gould is theoretically possible; however the brittle, loose nature of the rock in Glacier National Park makes the ascent highly technical, unpleasant, and dangerous. Mount Grinnell is a peak located in the heart of Glacier National Park in the U.S. state of Montana near Mount Gould and Mount Wilbur. It is named after George Bird Grinnell. From the Many Glacier Hotel on Swiftcurrent Lake the "false peak" of Grinnell Point can be seen.